Just below center-left, is AR1520, as seen from Northeastern Ohio on July 12 at 6:18 PM EDT. 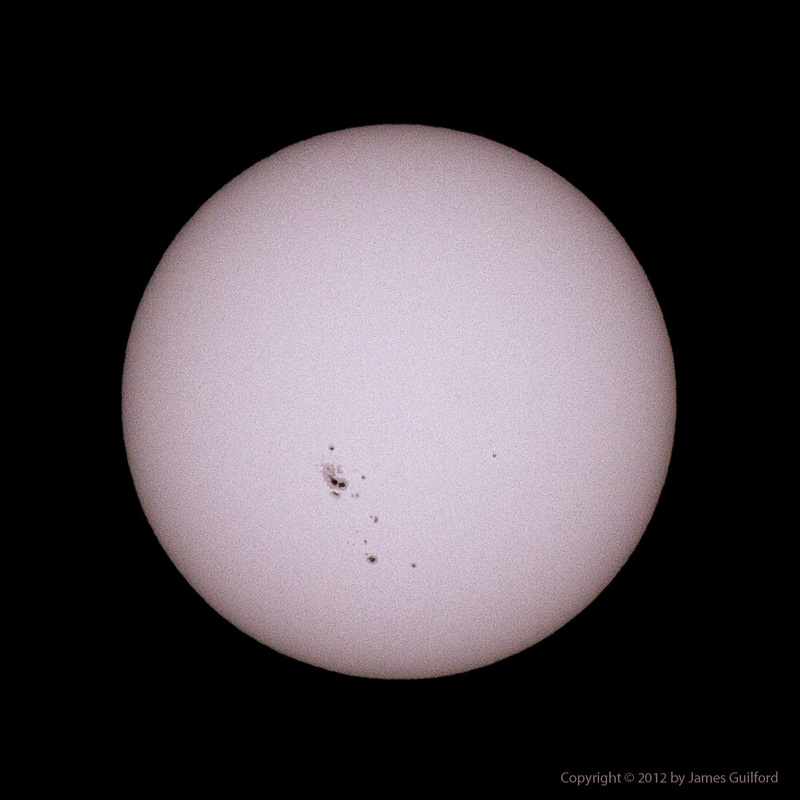 Dominating the face of our Sun, this week, has been an enormous group of sunspots including those designated AR1520. The active Sun has been very interesting to watch, of late, as the dark spots rotated over the star’s limb and towards the center of its disk, facing Earth. Hydrogen-alpha observers have also been rewarded with good numbers of prominences spouting into the blackness of space. Forecasters stated AR1520 had great potential for flare activity and on Thursday, July 12, the forecast was fulfilled — just as the sunspot was aimed directly at Earth. As so often seems the case, weather forecasts for the weekend include plenty of clouds to interfere with the view. Still, aurora fans should stay alert to active displays and the potential for clear skies; it could be a good show! UPDATE: The CME impacted the Earth’s magnetic field at ~ 1800 UT or 2:00 PM EDT, July 14. Photo above: The Sun with prominent AR1520 accompanied by smaller sunspots. Canon EOS 50D: ISO 400, f/11, 1/1000 sec., 400mm telephoto lens with AstroZap white light filter, 6:18 PM, July 12, 2012 — “just before the clouds rolled in,” according to photographer James Guilford. This entry was posted in Uncategorized and tagged astronomy, astrophoto, aurora, northeastern ohio, photograph, solar, solar flare, space weather, sun, sunspot. Bookmark the permalink.